The Grand Lodge of Theta Delta Chi takes hazing allegations very seriously. If you feel that you or someone you know is being hazed, do not hesitate to call the Anti-Hazing Hotline at 1-888-NOT-HAZE. It is toll-free and confidential. 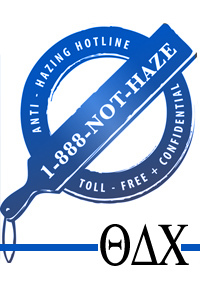 Theta Delta Chi is proud to be one of many Greek organizations sponsoring the Anti-Hazing Hotline. The Hotline, run by the publishers of Fraternal Law, will transmit reports of alleged hazing to any fraternity or sorority, and the authorities when applicable, regardless of sponsorship. At the 157th Convention, Theta Delta Chi defined hazing as "..any action or situation created, intentionally, whether on or off fraternity premises, and whether with consent or not to produce mental or physical discomfort, embarrassment, harassment or ridicule. Such actions include but are not limited to any activities that are not consistent with the Constitution or By-laws of Theta Delta Chi, fraternity policy, federal, state, or local laws, or policies of a host institution." Theta Delta Chi insists that all new member programs be directed towards creating a better understanding of the fraternity, and the understanding of opportunities for self-improvement that are offered for the individual that are congruent with that of the Charge or colony’s host institution. New member programs may not be longer than twelve weeks. Any charge of Theta Delta Chi that requires assistance developing a rewarding and enriching new member program should contact the Central Fraternity office immediately.